And after updating path (19th point), chat window disappears. Please help me with editing the index.html file inside “/SDKApp/sdk/UI” folder. Hi @ankitsaini345 please try the steps given below and check once again. Download your web applications web-sdk folder, unzip it, go to UI folder and EDIT index.html file and enter the following details and save. Sample attached. url: “http://localhost:3000/api/ /users/getJWT”, //this is sample url of my localhost. This should include the url where you are hosting the bot. You find all these values in Apps and Agents - Web/Mobile SDK in your bot. Once you save the index.html, run it . I did all the steps but still getting the same error. @ankitsaini345 Can u share your index.html? I am sharing a screencap of sample index.html for your reference. The url is see is pointing to my local host. The problem was with the localhost URL. Now its working. I have developed an angular UI application and need to integrate the bot with the same. How can I open the chat bot with a button in my index file? @swathi.vadlamani Do you help me with JWT configuration? I don´t know how do it. 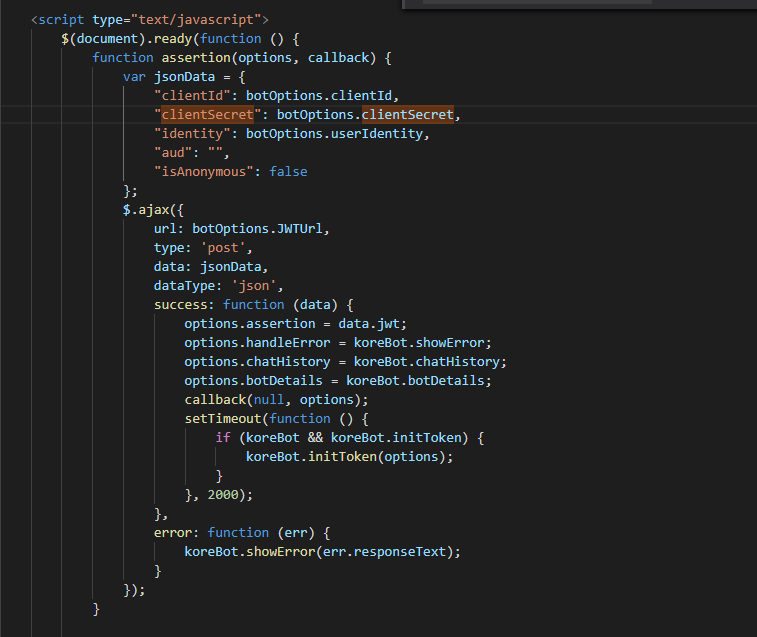 I am also following the same tutorial (https://developer.kore.ai/docs/bots/kore-web-sdk/kore-ai-web-sdk-tutorial/) and I am also facing the same issue. I followed all the instructions you mentioned to @ankitsaini345 but still facing issue. I think I am missing something. 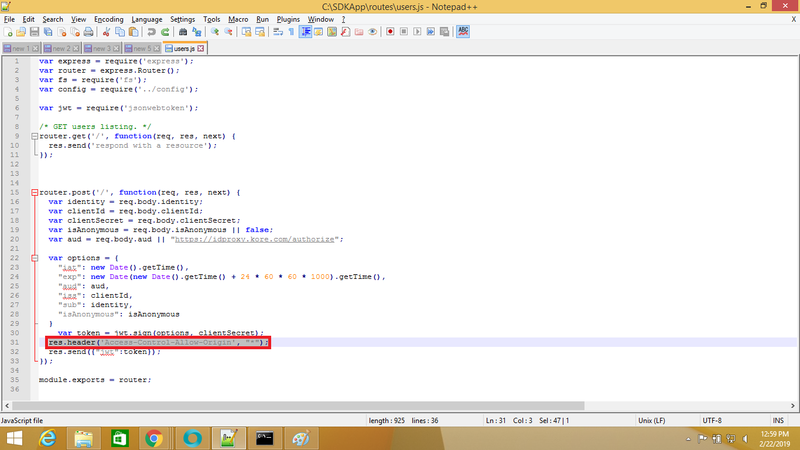 I am attaching the snapshot of the error and index.html. I am still not clear with the JWT url that we need to mention. Which URL we need to mention in botOptions.JWTUrl. I think the problem is with URL only. Please guide me. Could you please check if the bot has been published? If not, please pass the developer email of the bot as user identity at index.html. 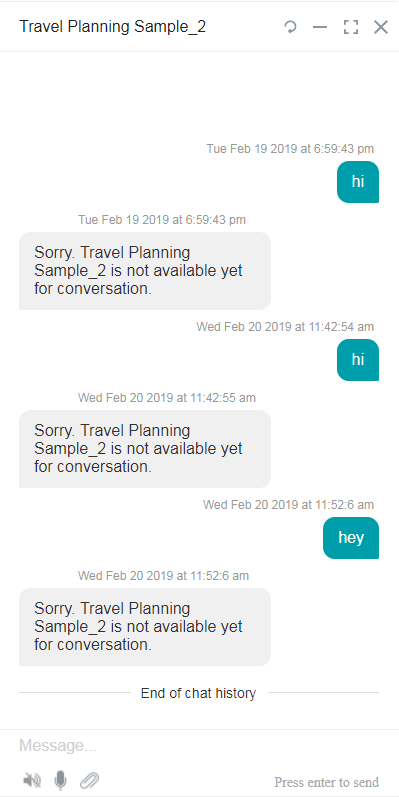 Once the bot is published on admin, as the bot is of purpose consumer, any identity can be passed in the index.html and the bot responds. 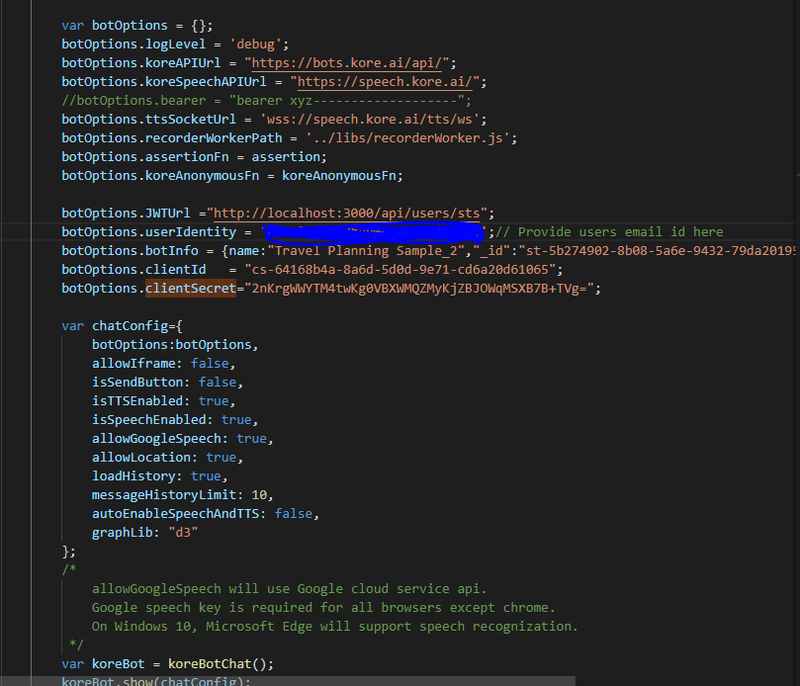 Bot is published and I am also passing user’s email id as user identity at index.html which I have blurred. As mentioned on Step 17, you have downloaded the SDKApp. As mentioned on Step 19, you have configured the index.html. Try with “isAnonymous”: true also. As JWT URL try with http://localhost:3000/api/users/sts . 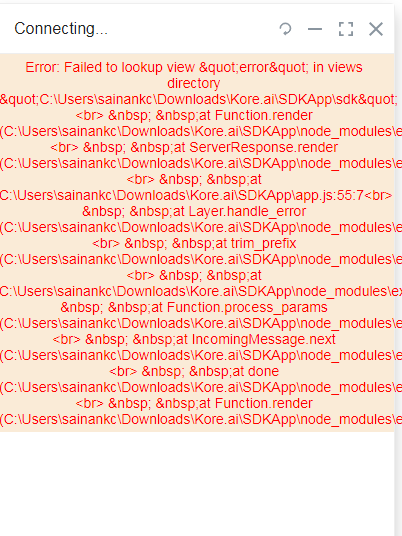 Note: SDKApp and WebSDK are different. 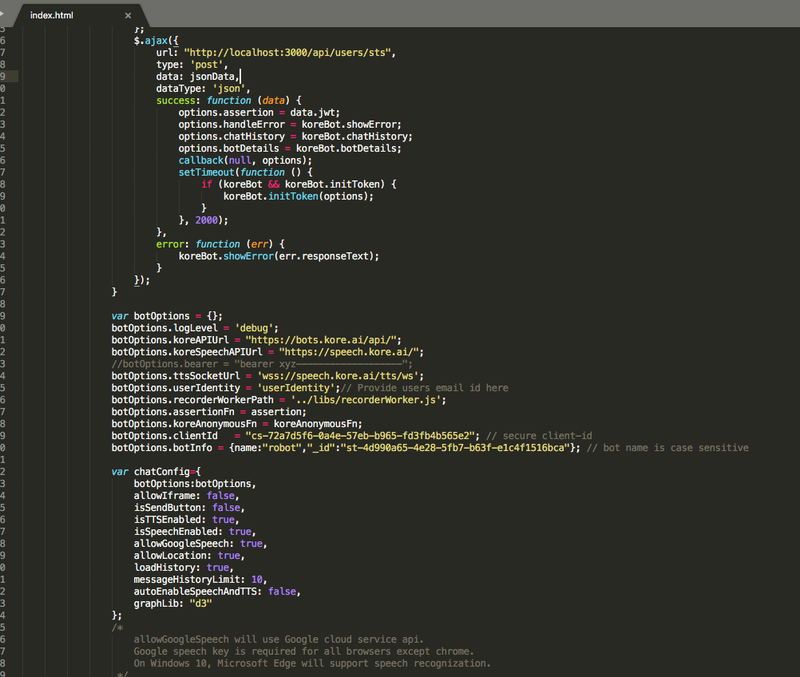 If all the mentioned steps are correctly implemented, you should not have any issue in the command node startServer.js. Invoke http://localhost:3000/api/users/sts in the browser. 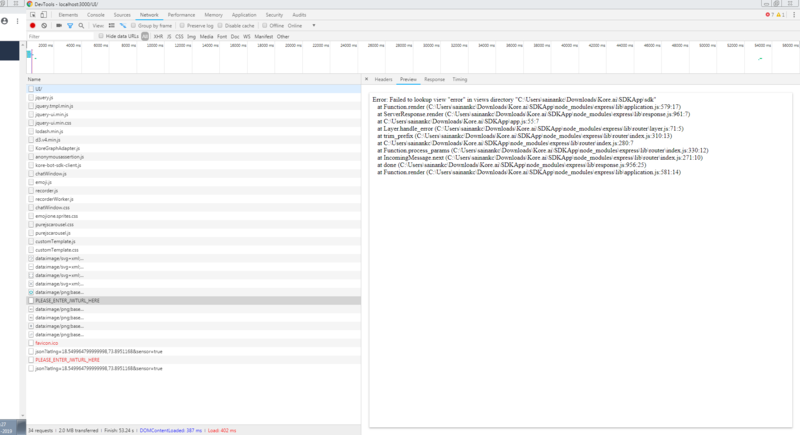 Now, invoke http://localhost:3000/api/users/sts in the browser to check. We will update the documentation as per the requirement. Please give us more details on your requirement/issue. On the error that you are getting on console, it does not stop any connectivity to bot. In your case, you are probably serving the index.html as https://localhost:3000. You can try opening the index.html as a file (right click --> open with chrome etc.) and you will not see any error on console. You can feel free to add these resources at the mentioned path and it should work. Any other error on console - Please deal with the error on a case to case basis. I hope this answers your question/ concern. I am facing the same issue and I’m hoping someone can advise. As well as setting isAnonymous to both true and false. I am also facing this issue (the issue of the original post) and I’m hoping you can help. Even i am facing the same issue. I have done all the steps which are mentioned in the document. In my case i am using enterprise bot. Have you started the SDKApp (node.js app)? You will need to have WedSK contents unzipped into SDK App. Start SDK App. Hope you all have read through this post in the thread above.